Any unwanted items must be returned at the customers expense to our office within 14 working days of receiving the delivery. All returned items must be returned with their original packaging, and with the returns slip filled out. If you do not have the returns slip, please write on the invoice or blank sheet of paper with the order and contact information. We aim to dispatch exchanged products within 2-3 working days of receiving the item/s back in store. A confirmation email will be sent once the item arrives back in store. If we require additional funds for the exchange, a notification email and phone call will be made. UK Mainland exchanges will be sent free of charge (up to kg). Exclusion may apply. Overseas exchanges will be charged shipping fees, which will be calculated based on item size, weight and delivery destination. Products returned outside of the 14 days returns period may not be refunded, and used as credit towards and exchange or future order. Refunds are completed Wednesday and Friday each week, so please allow up to 10 working days for refunds to show back in your account. 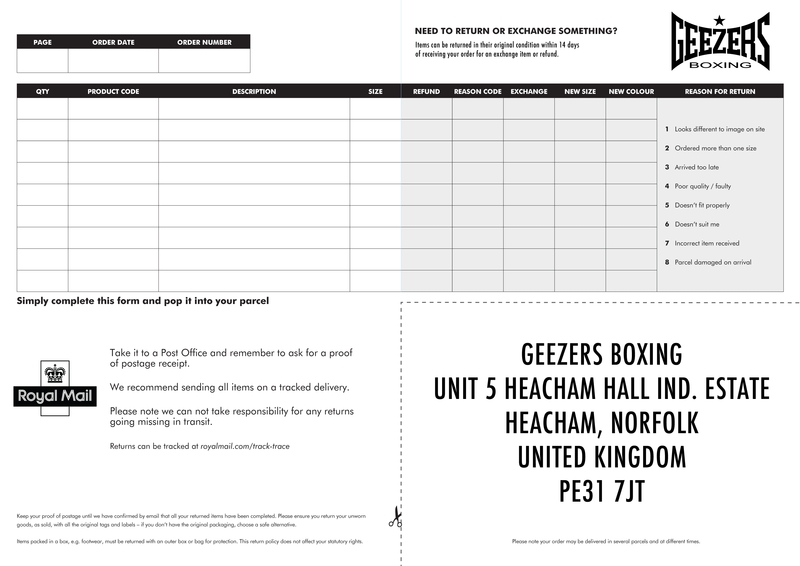 - Email images and description of the fault with your order and contact details to returns@geezersboxing.co.uk one of the team will pick up this email and explain the next steps. - If the product is within the manufacturers warranty period and the fault is agreed to be a manufacturers error, the returns postage will be covered by Geezers Boxing. If you can cancel an order after the item/s have been dispatched, the returns postage is to be covered by the customer. If the customer wants to return the item/s for a refund, the postage fee will not be refunded.